Nanak and Sikhism cannot be separated from each other. In fact, Sikhism is nothing but Nanak in practice. Hence, we shall deal with the entire subject as Nanak only. The beauty of it is that Nanak or his manifestation the Sikh Church is assuming even greater dimension as it is growing and evolving. And it is this aspect that we have tried to highlight more than anything else. For, it makes Nanak universal. 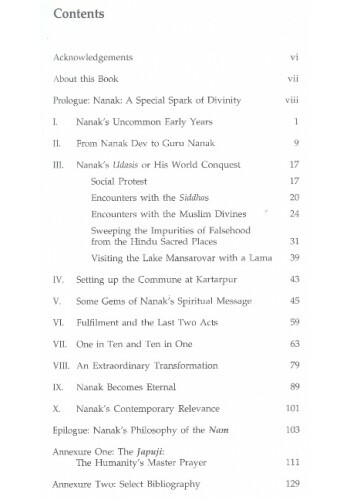 Even so, the book seeks to study Nanak as Ten Nanaks and lastly as eternal Nanak in whom each Sikh finds himself in the immanent protection of his Guru. Perhaps our fugitive world needs nothing better than this to be able to cope with the multifarious challenges of today and tomorrow. The Prologue and the Epilogue in the main help us understand this aspect. Happily, there is nothing pedantic about either Nanak or Sikhism. Both are a living lore of Punjab. They sprang up from the soil, as it were, as a spiritual faith of unimaginable proportions. Thus, only simple tools are needed to understand them as they grew from stage to stages. We have divided the subject matter into ten chapters to see how one aspect flows out of the other in a natural way. Besides, the book is suitably illustrated to help even the uninitiated to grasp the real import. 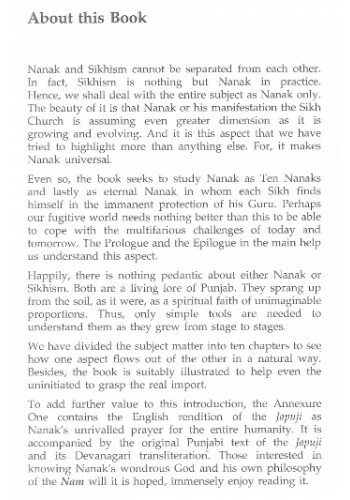 To add further value to this introduction, the Annexure One contains the English rendition of the Japuji as Nanak's unrivalled prayer for the entire humanity. It is accompanied by the original Punjabi text of the Japuji and its Devanagari transliteration. Those interested in knowing Nanak's wondrous God and his own philosophy of the Nam will it is hoped, immensely enjoy reading it. The basic point about Nanak is that though very much a historical person, he happens to transcend the limitations that history imposes upon man. He became a legend of impossible proportions in his own lifetime. Thus, any introduction of him has to draw upon material that's much larger than life. His persona and achievements can, therefore, only be culled out from a mixture of history, legends, myths and miracles that developed around him. 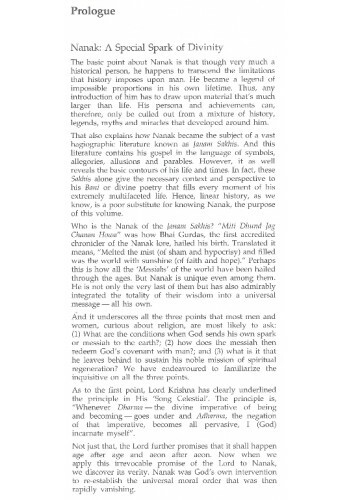 That also explains how Nanak became the subject of a vast hagiographic literature known as Janam Sakhis. And this literature contains his gospel in the language of symbols, allegories, allusions and parables.However, it as well reveals the basic contours of his life and times. In fact, these Sakhis alone give the necessary context and perspective to his Bani or divine poetry that fills every moment of his extremely multifaceted life. Hence, linear history, as we know, is a poor substitute for knowing Nanak, the purpose of this volume. Who is the Nanak of the Janam Sakhis? 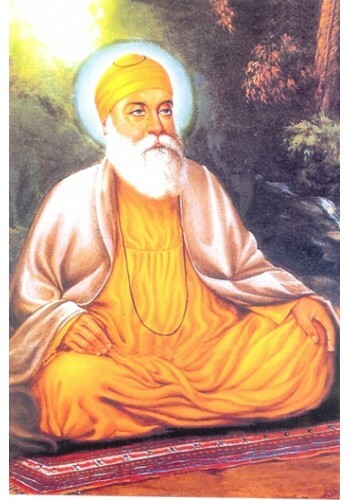 "Miti Dhund Jag Chanan Howa" was how Bhai Gurdas, the first accredited chronicler of the Nanak lore, hailed his birth. Translated it means, "Melted the mist (of sham and hypocrisy) and filled was the world with sunshine (of faith and hope)". Perhaps this is how all the 'Messiahs' of the world have been hailed through the ages. But Nanak is unique even among them. He is not only the very last of them but has also admirably integrated the totality of their wisdom into a universal message ---- all his own. And it underscores all the three points that most men and women, curious about religion, are most likely to ask: (1) What are the conditions when God sends his own spark or messiah to the earth ? ; (2) how does the messiah then redeem God's convenant with man? ; and (3) what is it that he leaves behind to sustain his noble mission of spiritual regeneration ? We have endeavoured to familiarize the inquisitive on all the three points. As to the first point, Lord Krishna has clearly underlined the principle in His 'Song Celestial'. The principle is, "Whenever Dharma ---- the divine imperative of being and becoming --- goes under and Adharma, the negation of that imperative, becomes all pervasive, I (God) incarnate myself". Not just that, Lord further promises that it shall happen age after age and aeon after aeon. Now when we apply this irrevocable promise of the Lord to Nanak, we discover its verity. Nanak was God's own intervention to re-establish the universal moral order that was then rapidly vanishing. It was no easy task. The age in which Nanak was born had badly divided both God and man. Men were engaged in dividing God and He, in turn, was doing the same to men. The main casualty was the sacredness of life. 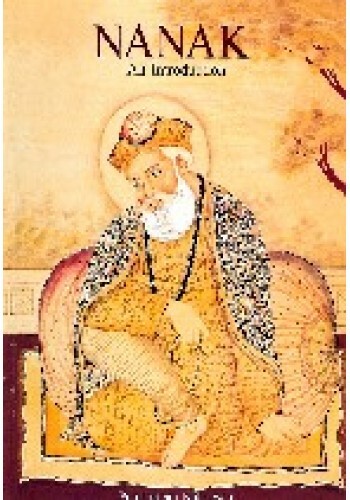 It is to this challenge that Nanak addressed himself. To accomplish this onerous task, he took nine rebirths and then became immanent to his Sikhs in the form of the Word God, thus laying the foundation of Sikhism, a uniquely corporate religion of the world. This way Nanak not only resurrected himself nine times but also became eternally relevant to the spiritual needs of man in this everchanging world. This task is by no means finished. The challenge of God dividing men and the vice versa happening exists in much worse form today. 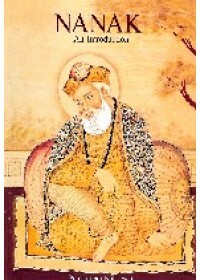 In his own time, Nanak had proclaimed the oneness of Ram of the Hindus and Rahim of the Muslims with unique success. But today Mohammed's Allah and Christ's Lord must also become one if humanity must survive. Hence, Nanak appears to be even more relevant now. For, his mesage alone has the potential of proclaiming the spiritual unity of God and man. Nanak's God is common to all, to every particle of creation. In practical terms, Nanak was forthright in attacking the life of escape, austerity, superstition , ritual, doubt, guile and duplicity. He advocated avoiding all extremes to follow the middle path. He established the truth by telling people to earn their living the hard, honest way and share it with the have-nots. He also asked seekers to constantly remember God through the Nam and live by His Reza or Hukum (will or direction) i.e. the inner voice. Nanak's Wahe Guru or God is full of immense grace and solicitude for the suffering humanity. No wonder then, he succeeded in creating such heroic and saintly men, making history at every step. In short, Nanak is a spiritual revolutionary par excellence. His very touch transformed a sick and moribund society into a dynamic and vital force in no time. In the form of Sikhism, he created an instrument that combined modernity with tradition and change with permanence. That's why his revolution has proved far more enduring than most historical revolutions. Also, in Nanak's path both men and women are uniquely equal and spiritual, and much above any gender bias. This makes the family a unit of society where God and his divinity dwell. "Ghar Vich Udas" is Nanak's cardinal status, which means all detachment must flow from commitment. In the end, while Nanak attaches utmost importance to truth, he rates 'truthful living' as of far higher purpose than truth itself. Thus, in every situation, he seems to opt for the practical than the abstract. In the 15th century, Indian society was a disturbing picture of rank ritualism, superstition, bigotry and social decay. The birth of Nanak in 1469 in the little village of Talwandi near Lahore, however, came as a miracle. The deteriorating Indian society had now found a redeemer. Nanak grew up in the midst of this orthodox society, more as a victim than as an observer and questioned its merits to the highest source. Intense and spiritually-driven even as a school boy, Nanak emerged as the Guru to lead the existing wayward thought to believe in one God and to embrace a more practical approach to living through his simple philosophy. Hailed as one of the greatest spiritual leaders of the mankind, Guru Nanak's message shook all corners of India and beyond, and resulted in the formation of India's youngest religion, Sikhism. What is most inspiring about Nanak's teaching is the timelessness of his philosophy that is as relevant today as it was more than five hundred years ago. This is because of its uncomplicated nature which disentangles the path to a fulfilled life. Nanak's deep insights on life carry seeds of solution to many issues faced by humanity as a whole. This book is an earnest attempt to celebrate his thought. 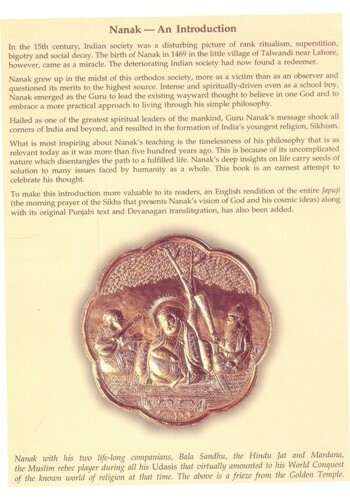 To make this introduction more valuable to its readers, an English rendition of the entire Japuji (the morning prayer of the Sikhs that presents Nanak's vision of God and his cosmic ideas) along with its original Punjabi text and Devanagari transliteration, has also been added.